90 records – page 1 of 2. 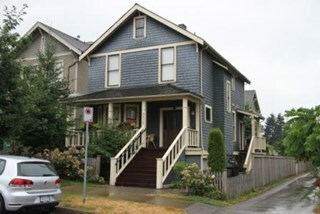 Bounded by Moscrop Street to the north, Kingsway and Grange to the south, Willingdon to the east and Boundary Road to the west, the Garden Village Neighbourhood is characterised as a primarily residential area that is well-served due to its proximity to commercial, park and business centres. The north-east corner of the neighbourhood is a typical 1950s subdivision of mostly single family homes located on an irregular street pattern, while the remaining areas saw some transition to multi-family housing types throughout the 1970s and up to the current time. This large house was built in 1923 and first owned by Casper Newhoven, who managed the Empire Transfer & Storage Co. from this address. It would appear his parents, Cornelius (1879-1959), a barber at Joe’s Place on Granville Street, and Catherina (1883-1981) and his brother Martin (1905-1935), a taxi driver for Main Taxis, also lived here. 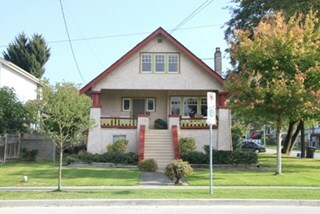 It is a well-maintained example of a Late Craftsman bungalow, and typical of the style it features a gabled roof, tapered verandah piers, multi-paned windows and stained glass sidelights. The round verandah columns are an unusual feature. The Newhovens had left this address by the time of Martin’s death in 1935. The Inman Avenue school was built in 1912. The original four-room building was expanded in 1923 and an additional four rooms were constructed. In the mid-1950s, the current building replaced the older structure. 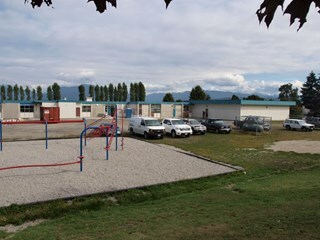 Chaffey-Burke Elementary School was built in 1963 and deviated slightly from the typical one-storey buildings that had been the standard for elementary schools in Burnaby since World War Two. At Chaffey-Burke, the restriction of space resulted in a second story level because of the slope. Additions to the building were made in 1964, 1968 and 1969. 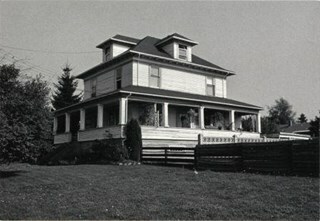 The Sandersons were pioneer settlers in the Central Park area, arriving in Burnaby in 1904. Thomas Sanderson (1878-1936) was born in Morningside, Scotland and immigrated to British Columbia in 1899. In Vancouver in 1903, he married Ellen Jane Garvin (1883-1965), a native of Sherbrooke, Quebec. 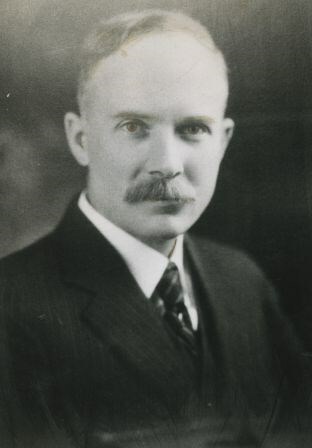 Thomas was chief of the Accounting Department at Hastings Mill, and served as Reeve of Burnaby in 1919 and 1920. One of his sons, Thomas, was a long-time teacher in Burnaby. 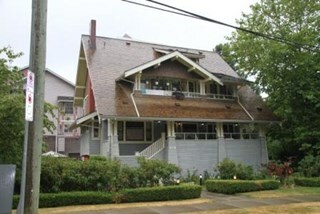 The Sandersons’ house was built in 1905 as a small Edwardian bungalow but was extensively remodelled in the 1920s and is a fine example of the Craftsman style and today remains in good condition. Typical of the Late Craftsman style, the house has a front gabled roof, triangular eave brackets, tapered window surrounds and a mix of textural finishes, including shingles and lapped siding. The Joseph Clarke House is a two and one-half storey, wood-frame house, with shingle siding, a front-gabled roof and a full open front verandah. 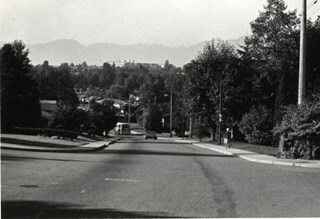 It is located on Jersey Avenue within the Central Park neighbourhood of Burnaby. Built circa 1909 for Central Park farmer Joseph Clarke (1851-1936) and his wife, Ellen (1864-1938), this Edwardian-era farm house is valued for its vernacular design, which demonstrates the utilitarian nature of working-class housing during the boom years prior to the First World War. The Joseph Clarke House is additionally valued for its link with the development of the Central Park neighbourhood during the Edwardian era. The advent of the Central Park interurban rail line in 1892, operated by the B.C. Electric Company, connected the area to Vancouver and led to its suburban development. This is one of the oldest surviving houses in the Central Park neighbourhood. It was designated as a municipal heritage site in 2005 and rehabilitated as part of the adjacent multi-family townhouse and apartment redevelopment. The Joseph Clarke House is comprised of a single residential lot located at 5575 Jersey Avenue, Burnaby. The Coburn House is a two and one-half storey plus basement Foursquare farm house. Prominently situated on a rise of land along the east side of Boundary Road overlooking Kingsway, it stands among single-family houses later constructed on its subdivided farm land. 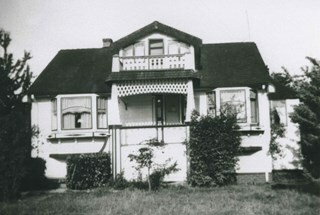 The Coburn House is important as a surviving representation of Burnaby’s early settlement period, when the municipality was largely an agricultural and residential suburb. It was built in 1910 by carpenter William Kirkham for Minerva Jane Coburn (1868-1940), and three years later the builder and client were married. Together, they operated the Surprise Poultry Farm, and were frequent participants at the local Central Park Farmers' Institute Exhibitions. This house is valued as an excellent and well-preserved example of a substantial Edwardian era Foursquare farm house. Significant due to its generous size, dominant symmetry, the prominent verandah that wraps around the front and both sides, and the three roof dormers, this house retains a high degree of original material and integrity. The elevated siting of the house, its tall proportions and symmetrical appearance combined with its fine condition make this an excellent example of its type. The J.A. Thurston House is a very large, two and one-half storey plus basement wood-frame Arts and Crafts style house. It is located on the south side of Thurston Street, near Kingsway and the SkyTrain (formerly the interurban tramline route), within the Metrotown area of Burnaby and is now part of a large apartment complex. The J.A. 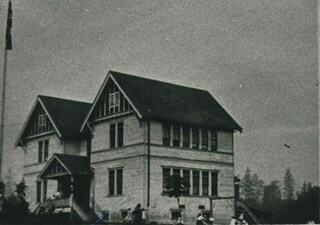 Thurston House demonstrates Burnaby's real estate and construction boom along the interurban tramline in 1911. The house was built for John Albert Thurston (1874-1944) and his wife Sarah Sedona Thurston (1879-1961). 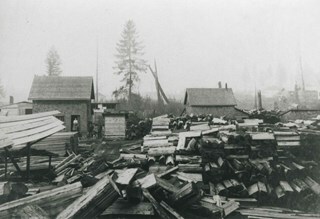 Typical of the entrepreneurial spirit of the age, John Thurston, a manager for the Leckie Shoe Company Limited in Vancouver, was also involved in real estate development, and purchased a twenty-one lot subdivision consisting of 3.2 hectares bound by the interurban tramline right-of-way to the south, Boundary Road to the west and Smith Street (now Thurston Street) to the north. Additionally, the J.A. Thurston House is an excellent, high quality example of an Arts and Crafts style dwelling, with numerous notable design elements such as the battered piers, the elaborate second storey dormer and stained glass windows with landscape and seascape motifs. The enormous scale of the house reflects a time when large families were common and domestic servants were needed to run the household. Indicative of the labour-saving devices and luxury features being introduced at the high end of the housing market, it was equipped with a built-in vacuum system, refrigeration, servant summoning devices and a round safe built into a fireplace mantle. The J.A. Thurston House also represents the proliferation during the Edwardian era of homes built from pattern books and standardized designs as a means to expedite the construction process and offer competitive costs. The J.A. 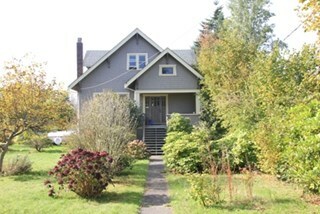 Thurston House is comprised of a single residential lot located at 3762 Thurston Street, Burnaby. St. John the Divine Anglican Church is a landmark wood-frame Gothic Revival church, with Gothic windows and spire. It is located on Kingsway, one of Burnaby’s main commercial thoroughfares, near the SkyTrain transit line and across the street from Central Park. 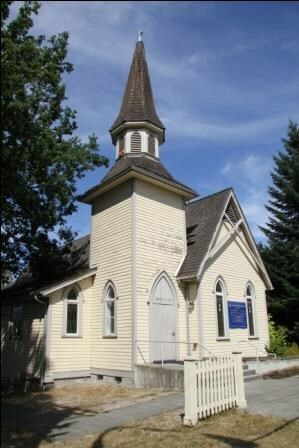 St. John the Divine Anglican Church is valued as a symbol of the traditions of early Burnaby pioneers and as the oldest surviving church building in the city. 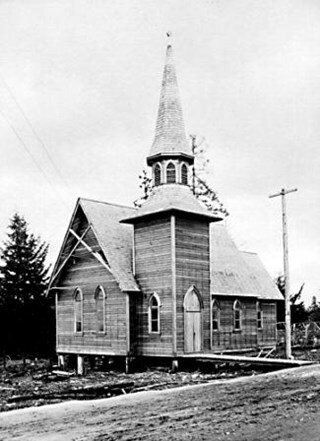 Established in 1899, St. John was the first church in the community and was located at a prominent intersection of the old Vancouver-Westminster Road (now Kingsway) and the British Columbia Electric Railway’s interurban station at Central Park. This prominent intersection of the road and rail developed as the town centre of the Central Park district. The first St. John church was destroyed by fire, and was rebuilt at the same location in 1904-05. This church is additionally significant for its association with prominent local architect Joseph Henry Bowman (1864-1943) who emigrated from England in 1888. Bowman was a member of the parish, and designed both the first church and its subsequent replacement. Bowman’s prolific career embraced many stylistic changes and technological advances, and this church is a surviving example of one of his rare religious commissions. The design of the new church's nave and vestry was based on the Gothic Revival style of Christ Church Anglican in Surrey, B.C., which had been the former church of St. John’s incumbent Rev. William Bell. Evolving over time as the congregation grew, the church received a number of early additions, and in 1953 was substantially renovated and enlarged through a new design by Vancouver architect Ross Lort. The original church nave was separated from the tower and turned to allow for a large addition. The congregation relocated to a new church in 1998, and at that time removed the church's memorial windows, leaving behind a number of the original art glass windows installed in the 1920s. The church building was renovated in 2004-05, and surviving original elements were retained and restored, including of the original church tower and interior chancel ceiling. A valued feature of the building is the original cast iron church bell that remains in the tower. It was purchased by the children of the congregation in 1912, and in 1924 was rededicated on Armistice Day as a memorial to Burnaby resident Lt. James Donald McRae Reid, who died in the First World War. St. John the Divine Anglican Church is comprised of a single institutional lot located at 3891 Kingway, Burnaby. 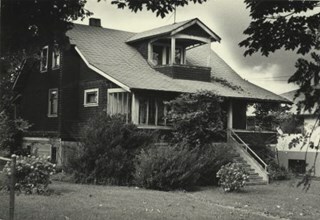 Photograph of "Campend," the Shankie family home. 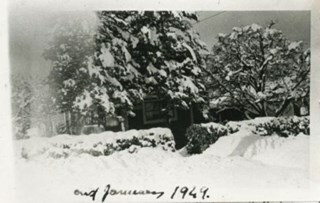 This photograph was taken following winter snows. The house was formerly numbered 3718 Barker Avenue and later renumbered 5155 Barker Avenue. Photograph of Janet Bower (nee Shankie) in Scottish regalia. The house was formerly numbered 3718 Barker Avenue and later renumbered 5155 Barker Avenue. Photograph of the Farrington family home at Bond Street and Chisholm Avenue (now Smith Avenue). Olive Farrington is standing in front, centre, with two friends. 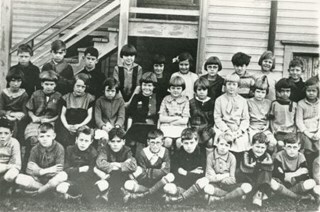 Photograph of Inman Avenue School students. Grace Farrington is in the 2nd row, 5th from left, next to the girl in the checked dress. 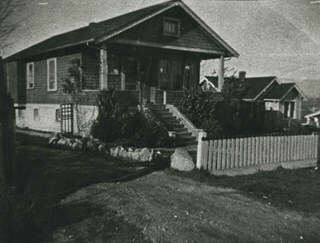 Photograph of the Engelland family home, 3706 Patterson Avenue (later renumbered 5587 Patterson Avenue). The family lived here from 1926-1953. Five children were born here, and they all attended Inman School. Photograph of Central Park Presbyterian Church and the surrounding area. The church was located on Westminster Road (later Kingsway) across from Central Park. 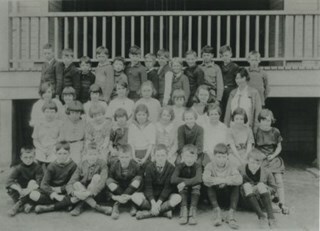 Photograph of a group of school children, likely from Inman Avenue School. 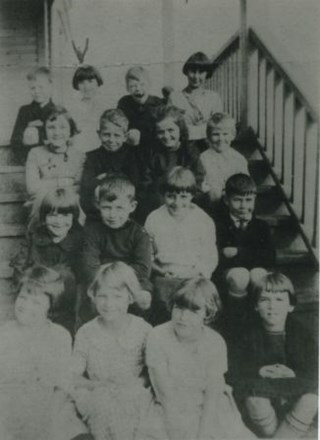 Photograph of a group of school children and a teacher, likely from Inman Avenue School. 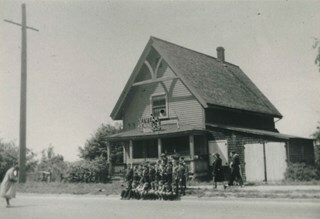 Photograph of approximately thirty young people posing for a picture on the sidewalk outside what has been labelled the old Presbyterian Church located at Kingsway, east of Boundary Road. A sign on the roof of the building reads "Vivian Kennels." 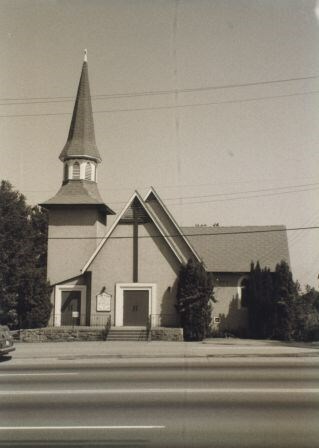 Photograph of the exterior of St. John the Divine Anglican Church, at 3891 Kingsway. Photographic postcard of St. John the Divine church at Kingsway and Central Park. Photograph of Chaffey-Burke Elementary School. 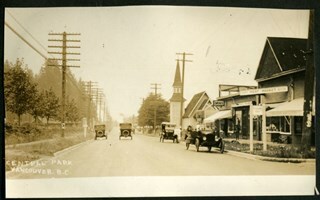 Photograph of for Model-T Fords driving along Kingsway at Central Park. St. John Divine Church is visible on the right. 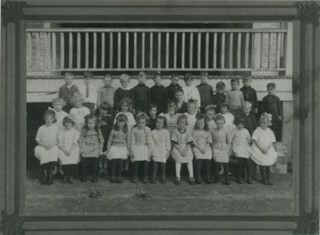 Continuation of title: "Vancouver BC"
Photograph of the exterior of Inman Avenue School. Photographer's writing (engraved on negative) reads: "Layton / Inman. Burnaby, B.C. / 1954"
Photograph is an aerial view of Kingsway and Barker Avenue, looking southeast from Central Park Place. 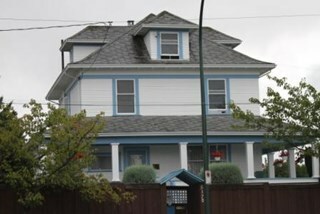 Photograph shows a house at 5625 Willingdon Avenue. 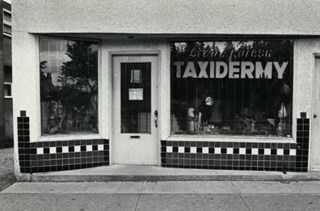 Photograph shows Steve Kulash Taxidermy Ltd. at 3977 Kingsway. 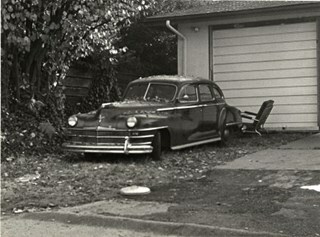 Photograph shows a 1947 Chrysler parked next to driveway at 3708 Cardiff Street. 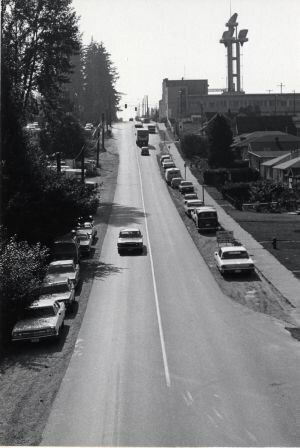 Photograph shows a view of Boundary Road looking south from the railway trestle just north of Kingsway. 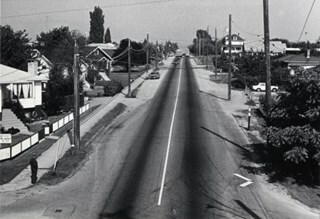 Photograph shows a view of Boundary Road looking north from the railway trestle just north of Kingsway. 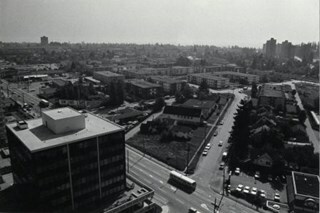 Photograph shows a view looking north up Gilpin Crescent from Price Crescent with Burnaby General Hospital in the background. Photograph of the exterior of Inman Avenue School at 3963 Brandon Street, near Kingsway. Photograph of the home of Richard and Clara Thorpe. Nancy Davis Allard is standing, holding baby Dorothy Thorp (later Spain) upright in a buggy at the foot of the stairs. Two unidentified woman are also visible sitting at the top of the stairs. Note in blue ink on verso of photograph reads: "Home of Richard and/ Clara Thorp - about 1911./ Built in 1907. 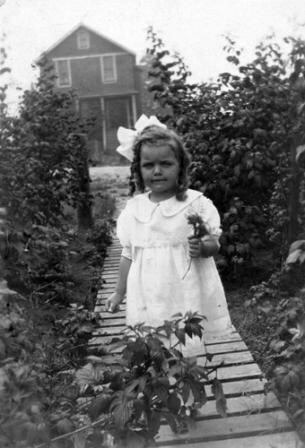 Boundary/ & Burke St. - Burnaby/ I'm in the buggy, held upright by my/ dear friend Nance -"
Photograph of Thomas Ramsay Shankie in the garden of the Barker Street house. He is seated on the edge of a washtub and holding a black cat. 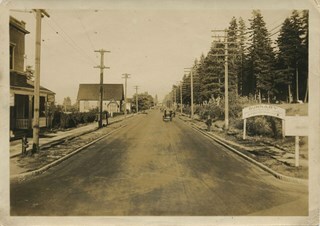 Ramsey Shankie was the only son of Bertha and Thomas Shankie, who lived on Barker Avenue (previously Barker Street) in Burnaby. Ramsey Shankie later married Ina Stanley, daughter of Frank Charles Stanley and Esther Love, daughter of Jesse and Martha Love. "Ramsay / & Inky / 1934" written on front of picture in black ink. Group photograph of mother, Bertha Gray Shankie, with her two children, Thomas Ramsay Shankie aged about three years, and Janet Shankie Bower, in arms. Group is seated on front steps of Barker Street house. Baby Janet is held between Ramsay on the left and Bertha on the right. 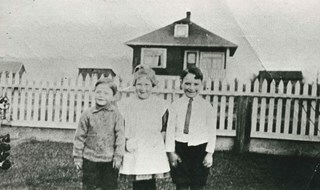 Janet and Ramsey Shankie were the children of Bertha and Thomas Shankie, Burnaby, who lived on Barker Avenue (previously Barker Avenue). Ramsey Shankie later married Ina Stanley, daughter of Frank Charles Stanley and Esther Love, daughter of Jesse and Martha Love. Janet Shankie eventually married Frank Bower. 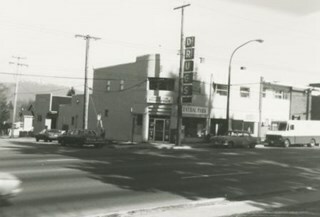 Photograph of Kingsway looking east at Boundary Road. A sign on the right reads, "Burnaby / Vehicles must slow down at all schools and intersections marked thus: X." A sign on a building at the left reads, "Arctic Ice Cream." Central Park is on the right.